Some of our partners-in-crime in Haiti are our good friends Almando and Cassie Jean-Louis. 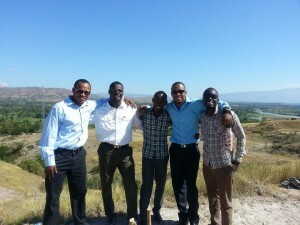 Living and working full-time in Haiti, they are our on-the-ground ministry coordinators for the country. They are raising their two beautiful children in their home-town of Gressier and living life to the fullest. I first met Almando on January 7th, 2012. After setting off on a crazy journey in my life. I was walking down the long corridor that led from baggage claim to pickups at the airport in PAP and there he was – jumping up and down (not unusual for Al), waving, with a huge smile on his face. Next to him was his Minnesota-born-and-raised, future-bride, Cassie, beaming from ear to ear, welcoming Marlo and I. And I remember thinking – oh wow I’m really here, they’re actually here…alright, we’re doing this! Fast forward to today and we’ve come along way since that first moment at the airport. After (almost) 4 years of friendship, we’ve grown, rejoiced, disagreed, laughed, cried, learned, argued and loved together. But it took a lot of life to get to here today, as I was thinking back on those first months I spent in Haiti, I think back to all the pivotal moments I had with them by my side. Learning Creole, day by day. Learning all about Haiti and it’s many facets of life. Learning how to make educated decisions when it came to missions – everything wasn’t as simple as I thought it would be. Growing in who I was as a woman of God, wife and friend. And ultimately, changing the course of my life (and our family’s) as Eric visited and we fell in love with this ministry. Within PPM, Almando and Cassie serve as our full-time missionaries in Haiti. Almando is our Ministry Coordinator for all of our pastor partnerships, ensuring healthy ministry is happening and that their visions and needs are being heard – that we aren’t just bringing in teams that will push their agenda onto a partnership. Cassie serves as our Staffing Manager for our 30+ Haitian staff that serve with us weekly, providing further training and together, they oversee many other components of our ministry, like undertaking the monumental tasks of placing our teams with partnerships in Haiti, coordinating training seminars for our staff and making our schedule for the summer. 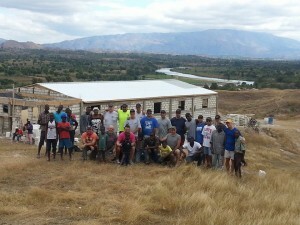 One of the awesome things that they’ve been up to lately is our Haitian staff mission trip. Where all of our staff serve a community in their own country for a week, just like the teams they serve alongside week in and week out. I hope you enjoy hearing just how amazing of a week it is for our staff, as they serve the people in their own country. 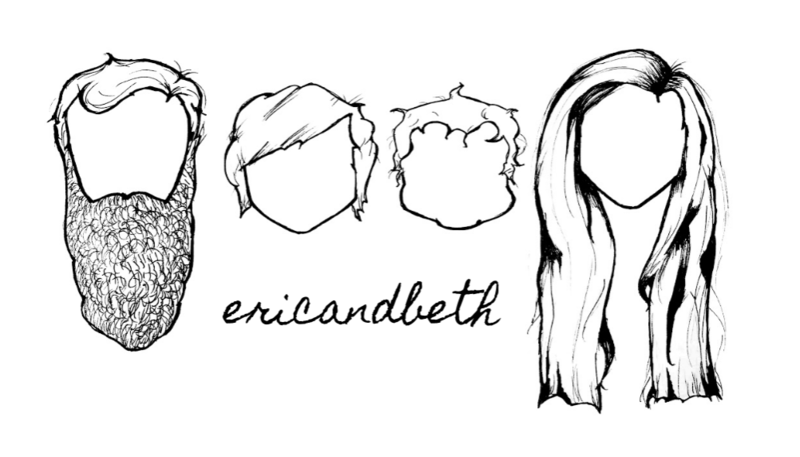 And don’t forget to follow along with Almando and Cassie – on their blog! 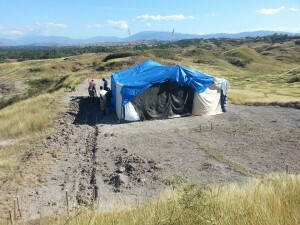 Last year, my wife and I came up with the idea of leading our Haiti Staff on a mission trip. 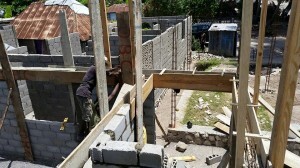 The idea came when we thought back to the sacrifices a lot of people from the United States make each year to support the work of Praying Pelican Missions in Haiti and in all the other places throughout the world where PPM partners. 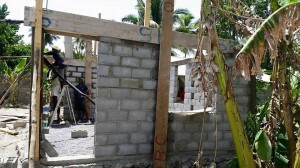 Early in the year of 2014, I asked our Haitian staff to set aside some of their weekly paycheck for our staff mission trip. We knew it would be quite the sacrifice, but we pressed forward. So, we opened a bank account for that purpose and those of us who took the idea heartily deposited on the account on a monthly basis. 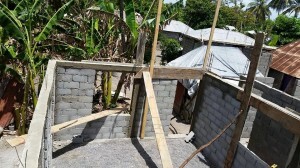 In November last year, we heard about a church from Iowa that wanted to come to Haiti and work on a church from beginning to end – they wanted to start a project AND finish it. 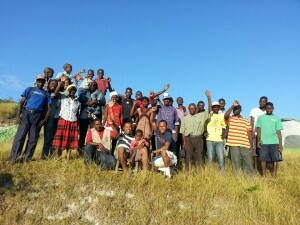 In December, our savings added up to $1,600 US, so we scheduled our trip for the week prior to Christmas Eve so we could make it possible for the group to come. Because of the date, turns out it wasn’t that convenient for most of the staff, so only 6 of us could make it. But that didn’t stop us! We used $500 for food, transportation was graciously provided by our transportation coordinator, Eli and we stayed in tents. 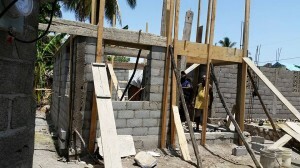 That left us with $1,100 to gift to the pastor to purchase supplies to start the foundation of the church. 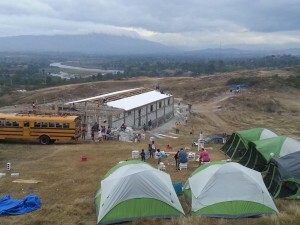 We spent 5 days working hard digging the foundation of the church. The church and community members were very happy and amazed to see a group of Haitians spending their money and their physical energy to work for the Lord. They kept saying over and over that we blessed them and as a result, they all joined in to help and when we could not work anymore, they kept going until 9 pm. It went on like that the entire time we were there. We also had the privilege to pray with a young boy that was oppressed by an evil spirit for many years. When the spirit possessed his body, he ran wild for hours and no one could catch him or hold him. Since we prayed with him, he never ran again. Also, we had the chance to partake in a unique ministry – hair cutting ministry! It’s cool to see how God can use any gift and talent for His kingdom work! As we were wrapping up and witnessing all the work we were able to do, we decided that we would give more financially this year so we could do more physically next year. A couple months before the trip this year (2015), I felt in my heart to help a family instead of a church so I posted the idea on our Facebook staff page. One of our staff members is also a pastor at a church in a fishing village named Granbouchi in Torbeck, Haiti -south of Port-au-Prince. He mentioned that there is a family that could use a new house in the community and that it would be great if we could help. Without hesitation, I said yes and the rest of the staff also agreed with the idea of helping that family. So we scheduled the trip for August 22 through the 26. Only 10 of us could make the trip, and many of our staff who wanted to go could not, because of their schedules, but they sent their spiritual participation. We raised right around 90,000 gourdes ($2,000 USD) which we gave to pastor Jean Delcy to purchase supplies and to also feed us. Pastor Jean Delcy was generous to us to let us camp in a beautiful garden that he developed over the years, called Eden Haiti. We arrived on Saturday the 22 in the afternoon. After eating a good meal that was prepared for us, went to visit the house made out of straw and palm tree strips. Pastor Jean had kept it a surprise and didn’t tell them we were coming until Saturday morning when he knew for sure we were coming. As soon as they heard why we were they and what we wanted to do for them, they emptied the house out! After we ate, we headed to the house to take it down. When we got there, some guys had already taken it down in less than 5 minutes. We helped moving the remains of it away and started digging the foundation right away. Once again, our presence was a sight never seen before for that family and the community. 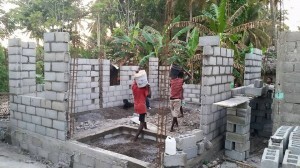 They are used to seeing Haitian missionaries coming to preach but not to work with physical labor and American missionaries coming to do the kind of work we came to do. It was indeed an inspiration to many people in the community and they joined in with us to help build a new house for that family. On second hand, we were amazed by the willingness of the masons and helpers who joined with us to complete all the complicated and skilled masonry work that we couldn’t do – without asking for a penny. We are used to paying professionals to do the work that our Pelican teams can’t do but it was different this time because we were a different crew – a local crew. We were also shocked by and drawn to the simple life that the people in that community live. Many of us had been to that community before, but this time we were immersed in the community, so we were able to experience their daily routine. Back in Port-au-Prince where we come from, we see houses hidden behind walls and some with razor wires in top of the walls… but in Granbouchi, the front door of a house can be only a piece of decoration, like a curtain, or no front door at all. That makes us think about just how different life can be in our country, from place to place. 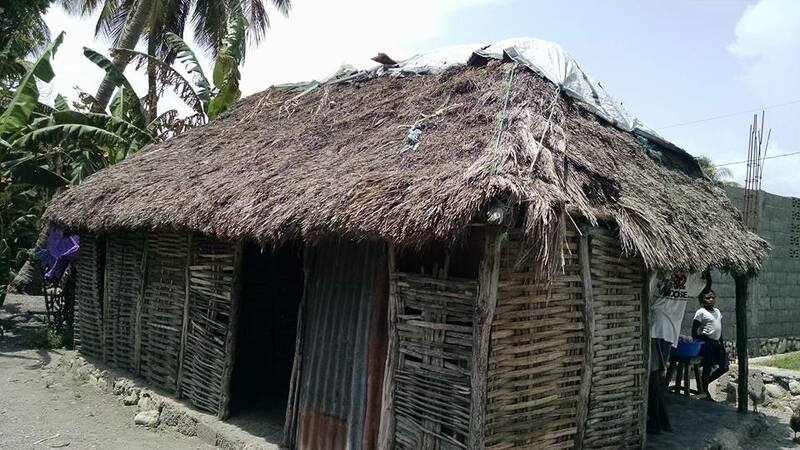 Just a mile away from the home we are working on we see people doing many things to survive and have an income (as in most of Haiti). But in Grandbouchi, most of the people we’ve met, do one thing to support their family: fishing, fishing, fishing. From the rising to the setting of the sun, there isn’t a minute that goes by without seeing a couple of heads bobbing on the ocean tide, diving for whatever comes about on the ocean floor: crabs, lobster, sea monsters etc. 😉 It’s the norm to see a couple of strong fellows pulling in a net of fish at all times of the day. When it hits the ground, nothing escapes from it as long as it can be eaten. Many would call it extreme poverty but we call it beautiful. We were amazed by the feeling of community and the simplicity of life and the big family of workers that came alongside us to bless that family with a new home. 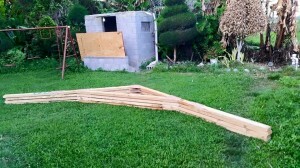 We were able to get the structure ready for the roof and all the roofing supplies. 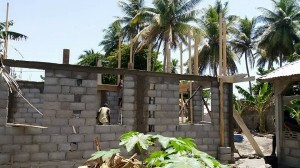 Pastor Jean Delcy will follow up for us until the family moves in which will happen this weekend. We also had the privilege to introduce the home owner to Christ as we treated the family and the helpers to a big dinner on Tuesday night. God be praised for his precious soul! Some people said that not only he has a home on earth but also a home in heaven. Once again, all the staff that went plus my wife and I were so impacted that we are all on fire and are advocates of the idea of missions within our own country. We are already counting down the days for next year and we are hoping to do something greater next year (Lord willing) and add on our service fields. 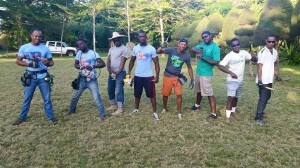 Side note: Matt Pfingsten was 28 when he started PPM and I was 28 when I started our little Haiti Pelican Mission trip. Coming alongside Jean Delcy as locals to shoulder his ministry is such an inspiration to us and him and his community that I feel like the idea will be become big and revolutionary. Can you pray that God would allow it to become big and revolutionary in my country? Check out the other posts in our “StoryTellers” Series!! Everyday, every week, every trip, we at Praying Pelican witness God among us. We get to experience the BIG incredible life transformations, people coming to Christ, a house being built for a single mother – but we also get to experience the LITTLE moments that are equally incredible, but are completely different. The child who looks up at you and you see Christ in their eyes, the mother down the street who laughs so hard she doubles over as she dances with a team member. These are the stories that make up our weeks, days, moments.